Charles and I created the Carbon Tax Center because prompt and effective action to reduce carbon emissions is imperative to slow and then stop the world from hurtling towards a climate disaster. We are convinced that a carbon tax is essential to reduce U.S. emissions quickly and steeply enough to prevent atmospheric concentrations of CO2 from reaching an irreversible tipping point. Unfortunately, the Bush Administration is doing practically nothing and most of the proposals for action do not go far enough. We want CTC to serve the climate advocacy community. Please tell us what you think about our web site, what you like, what you want to change, etc. We’ll listen and respond. Based on mounting evidence of slow but steady melting of continental ice sheets, scientists are now warning that the glaciers in the Alps will be mostly melted by 2050 according to a Jan. 21 AP story. California recently announced plans to reduce carbon emissions by 25% to 1990 levels by 2020, and by 80% below 1990 levels by 2050. The United States Climate Action Partnership (industry/environmental groups) proposal announced yesterday (Jan. 22) calls for a carbon dioxide emissions drop of only 10 percent to 30 percent from today’s levels within 15 years. Fast enough? Here’s a sampling of e-mails to info@carbontax.org since our launch yesterday. Keep those cards and letters coming. Even better, comment here, on this blog. Please also add a link to CTC on your Web site. Tell your friends and neighbors. And feel free to donate. Already received: 6 contributions totaling $500. We’re thrilled and grateful. per capita carbon dioxide emissions are at least twice those of most European countries such as Belgium, Germany and the U.K., and 2.3 times those of the Netherlands. Americans also emit 2.1 times as much CO2 per person as Japanese … and roughly five-and-a-half times as much as the average for all non-Americans on Earth combined. Click here for 2003 country data. Last week’s New Yorker magazine carried a profile of energy-efficiency apostle (and, as it happens, my college classmate and longtime acquaintance) Amory Lovins by the magazine’s global-warming reporter Elizabeth Kolbert. "Mr. Green — Environmentalism’s most optimistic guru" is a fair, digestible (at just 8 pages) portrait of the Rocky Mountain Institute CEO who reconceptualized the energy debate in the 1970s and is still tirelessly pitching his message of synergistic, human-scale energy solutions to the world’s political, financial and industrial leaders. Back in the day, I was a member of Amory’s worldwide web of energy analysts who fed him our cutting-edge research (mine concerned cost escalation in the building and operating of U.S. nuclear reactors) and benefited in turn from his incisive editing and brilliant framing of our work. Along the way, however, I grew skeptical of his faith that human ingenuity and care would catalyze the dreamed-of wholesale shift to energy efficiency and renewables. Advances in efficiency, and there were many, seemed scattershot and outweighed by humankind’s capacity to invent ever more uses of energy and our boundless appetites for using them. The key difference in our outlook turned out to concern price. Amory, the physicist and optimist, considers high energy prices helpful but not necessary, whereas I, an economist and, dare I say, a realist, regard them as necessary though not sufficient. Thus, the Carbon Tax Center. … the example Lovins likes to point to — the drop in oil use in the early nineteen-eighties — is, at best, equivocal. As Lovins notes in his book, what made people "pay attention" to oil consumption was the 1973 Arab oil embargo and the second, even more severe 1979 oil shock. Part of the drop was due to structural shifts in the economy away from oil-intensive activities. 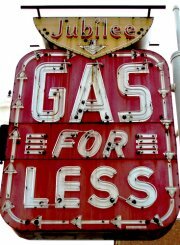 Part of it was fuel substitution by both individual consumers and industry, as homeowners and factories switched from oil to, for example, natural gas. The largest part of it was increased fuel efficiency in both automobiles and buildings, led by the creation of federal auto efficiency standards in 1975. And, finally, part of it was a change in consumer behavior as Americans bought smaller cars and turned down their thermostats. Thus what Lovins offers as a demonstration that federal regulation and new taxes are unnecessary could just as plausibly be seen as evidence of exactly the opposite. My point — and CTC’s point — exactly. And Thomas Friedman’s point too, perhaps. In his first New York Times column after Kolbert’s article appeared, Friedman wrote of the need to require "power utilities, factories and car owners … to pay the real and full cost to society of the carbon they put into the atmosphere." In case the point wasn’t clear, Friedman added: "… prices matter. They drive more and cleaner energy choices." Although Friedman didn’t mention Lovins by name — he’s a big admirer of Amory, as am I — I’ll bet he wrote with the New Yorker profile in mind. 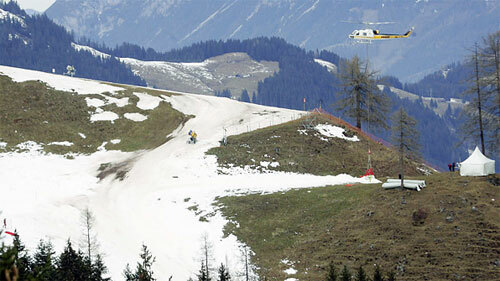 The photo shows a helicopter delivering snow from a nearby mountain pass to a low-lying ski area for a race to be held Jan. 26-28 in Austria. If you look carefully you can see the suspended net dropping the white stuff on the barren hillside. If even half the cost went for fuel, and if the fuel cost $3 a gallon, then the aerial ski portage consumed 65,000 gallons of petrol, roughly what 100 SUV’s would burn in a year. To enable a ski competition … incapacitated by global warming!